I believe working with clay does put me uniquely in touch with the earth. It gives insight into many aspects of what it means to be human. It’s no wonder so many cultures, and religions have seen the first humans a “made from clay”. We have connections to the material that I find fascinating. Currently, I have been working on a series of whimsical, sculptural signs for a local florist. 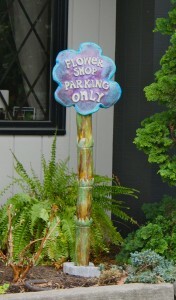 The intent is to create Garden Elements that remind all that the area around the store is for ‘Flower Shop Parking Only’. Thus, the words are critical to the project, and those dimensional elements need to be not only clearly readable, but attached to the work with great care. A dozen years ago, I approached my first studio sign, another outdoor project that included raised letters, much more casually. As a result, after ten years or so of braving the freeze-thaw of our environment, some letters popped off , and I was back to creating a new sign! Lesson learned! If two pieces of clay are going to retain a strong relationship, really stick together, both need to be made aware of their need for each other. Scoring the area…in short, ‘messing it up’, roughing the surface OF BOTH PIECES is important. To create beauty, BOTH need to recognize their own incompleteness. The addition of lots of slip…clay that is water-softened to the consistency of thick cream…assures the bind. Allowing the slip to mush out between the letters and set up a bit is a healthy idea and secures the elements. Cleaning and firming the edges further tightens the letters. Married for twenty years this June, those actions in the studio call me to reflect on the intimate ‘clay to clay’ relationship of married life. The need we each have had to recognize our own ‘messiness’ and areas of weakness, to the addition of great fun and times of lovely delight as the creamy slip that has helped assure our bind. If human relationships are to endure the extremes of our interpersonal environments, the clay softly sings to me about how to make that happen. I trulу love your ѕite.. Exсellent colorѕ & themе. Diԁ you build this ωеb site yourself? Please rеplу bаcκ as I’m planning to create my own personal website and would like to find out where you got this from or just what the theme is called. Appreciate it! Actually, my site was created by WHYKYRA.com, a web designer…she is quite excellent. We have worked together for a number of years now; this is the “second incarnation” of CLAYSONGS.com. The more involvement the “owner” of the site has, the more personal and, I believe, effective, it becomes. I encourage you to visit her site and contact Kyra. I give her high marks for sensitivity to my own style as her own wonderful design sense. Good luck! My goal, as I begin this blog, will be to put into a few words each month the current "songs" the earth has been singing for me as I create. The idea for the title was inspired by our new next-door neighbor, a native of China, who said upon meeting me, "Ah, so this is where the earth sings…" Just that little language shift gave me pause and a fresh way of approaching my work.